If you read this newspaper you can most likely name 10 people in our Parliament. I don’t care which side they’re on. As long as you can name 10 individuals, you are twice as well-informed as I am. I don’t quite pay attention to matters I can’t really control. Sure, we’re ostensibly living in a democratic republic, but I find that whether our entire political system is a blur in my mind or not, I’ll keep doing all it is I do regardless. So, I devote no attention to it. Occasionally there is a major discussion about something I care about. When that happens, I prick up my ears and pay attention, possibly having my say. Then I go back into my blissful bubble of insulation from the noise. Recently, on my way to Gozo, there were attempts to drag me into a debate about a tunnel that joins the two main islands. Well, I don’t live in Gozo so I shouldn’t really have an opinion because people who live there are likely to be affected by a hard link while to me it will simply be another way to cross from one place to another. Some people just won’t give up. I was pressed for an opinion. Well, I said, I want a train. I want a train with big windows that’s suspended from the underside of a bridge so while crossing I can enjoy the thrill of hurtling above a body of sea at speed. The bigger picture, whether a firm link is established or not, does not depend on my opinion. Give me a train and I’m as happy as anyone else with an opinion. In time, people stop pressing me for an opinion for fear of having to listen to me rationalise something totally trivial. Now if you were to ask me what kind of food I’d like once I get to Gozo by whichever method of propulsion or perambulation, I do have an opinion. I’d either like simple and real and inexpensive or I’d like something really, really interesting. I’m bored. I’m bored of eating the same stuff that’s been packaged into a ‘concept’ in the hope we won’t notice it’s more of the same. I’m done with pizza, pasta, salad, and grill on a menu that spans 20 pages and ends with chicken nuggets for the kids. If it’s not real or exciting, feed it to others. The last time I was in Gozo for a few days I ate here and there, even trying out a couple of places that were suggested to me. One of the restaurants that came recommended was pretty depressing, even if the food was decent. Another one turned us away because we had no reservation but I was happy that it happened. The food shots looked significantly better than the place did. One quick meal I enjoyed was at what could be considered a tourist trap. Rikardu in the gorgeous Ċittadella is real. They make their own cheese, the bread is lovely, the ravjul is stuffed with more of their own cheese, the service is informal and the price is right. In short, it’s real. Will it ever win a Michelin star? Of course not. But I doubt that’s their aspiration. They promise a meal that’s of the land and they deliver it. What’s not to like? The highlight of that weekend was lunch at a rather unlikely surprise that came in the form of Vini e Capricci by Abraham’s. Getting to it is part of the surprise. It’s buried inside an ‘agricultural village’ on the outskirts of Xewkija so it competes with garages and trucks and forklifters for attention. Calling it a restaurant is unfair. The restaurant part occupies less than a third of the entire complex. There’s an art gallery on the mezzanine, a large wine shop, a dedicated section to craft beers, an even more impressive selection of whisky, a large wine tasting area and a huge deli. The dining area itself occupies a comparatively small space at the back of the complex. The deli and butcher is where I felt like spending most of my time. When I see dry-aged meat displayed proudly, I get this wonderful confirmation that whoever is running the place understands meat. Your average shopper would recoil in horror seeing a T-bone that’s practically blackened on the outside. Others, like myself, salivate involuntarily. Everyone who served us was Italian and the menu is Italian. There are panini and taglieri, the latter most likely to go with the wines. Then we move on to salads, antipasti, pasta and main courses. The food is mainly traditional Italian with a flair that gives the place some personality. On top of that were the daily specialities as told to us by the man who was taking care of our table. He works with pride and is mainly efficient. He knows what it means to work the front of house, carefully upselling as he spoke to us. It was lunchtime and I didn’t want a drowsy afternoon so I asked whether they served wine by the glass. He suggested a lovely Valpolicella and brought a vacuum-closed bottle along to pour me a sip so I could taste it. It was good so I just waved him on to pour a glass. I’m fine with spending what turned out to be €15 on a glass of wine. I’d rather drink a small quantity of great wine than a whole lot of rubbish. It’s the action of suggesting a wine at that price that shows the way service works. The bread and oil that we’ve come to expect is dialled up a couple of notches here. The bread basket contained five different types of bread including a sumptuous focaccia, three olive oils including two mono-varietals, and three ways to salt. Knowing I’d ordered two courses I suppressed the urge to devour the lot and I’m glad I did. For starters, I’d ordered the octopus salad. It’s not the kind of salad that’s served on a bed of leaves. This is a very generous bowl of sautéed octopus, lentils and confit cherry tomato, with a little bucket of croutons on the side. 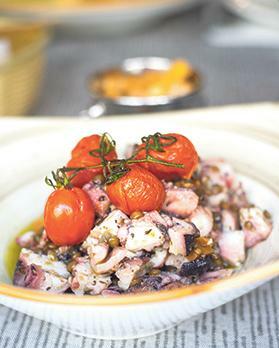 The oil they use for the salad is just as special as that served at table, the octopus the right kind of tender, the lentils retain just enough texture so they don’t fall apart, and the croutons add a pleasant crunch. If you’re not a big eater, this could be more than enough for lunch. The better half had ordered the soup of the day – a zucchini soup dressed with basil oil. It’s rich and thick and has a very starchy base so apart from tasting the part it is also a very filling dish. Much has gone into the experience at Vini e Capricci. The décor is tasteful, jazz standards played at a comfortable level all afternoon, our wine glasses were proper Riedel ones and the cutlery would feel at home at many fine dining restaurants. It must have been our walk through the deli and butcher on the way that made us both order meat for main courses. The better half went with the bollito, a slowly boiled beef dish from the North. It was served traditionally with a salsa verde on the side. It is a heart-warming dish I associate with cold winter days and this tasted very much like home cooking. Sides are served to share and we had steamed courgette, carrots, cauliflower and excellent roast potatoes. 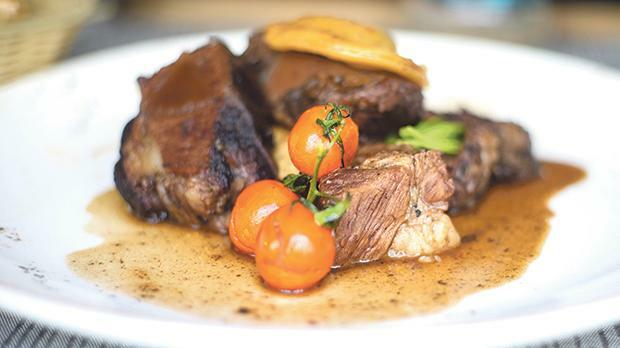 I’d gone with one of the daily specialities – a braised short rib. It was tender in places, had retained some texture elsewhere, and was simply chewy in others so I’m not quite sure what went on. The sauce was fabulous but so sparing I missed it by the time I was half way through. It’s served bone-in with a single, meat-filled raviolo on top and all placed on a disappointingly bland mash. The food had its highs and its lows but there is plenty to recommend Vini e Capricci. It’s priced on the high side – we paid over €80 for two courses and a glass of wine each. I’m curious about what it would be like to pick meat from the butcher and have it cooked there and then and I’m curious about what the rest of the menu is like. It’s real, it’s not cheap, but it is definitely interesting and that’s what will make sure I return.